The first Olympics I really remember was in 1988, with the Battle of the Brians, and the Battle of the Carmens, and Liz Manley coming out of nowhere with her cowboy hat. I’m a figure skating fan, obviously. I used to think about taking Cricket skating, on a lake, if a rink wouldn’t accept her. I think she would prefer hockey skates to figure skates, so she could do fast stops and flick snow on me. Butterfly would look adorable in a figure skating dress and four little white skates. This is the first Olympics where I don’t wish I could go in person; most of the time it sounds so exciting, to visit another country, to be there in the stands for the opening ceremonies, and to cheer on my favorite athletes. I love the ideal of nations coming together in peace and sportsmanship. I can feel my heart expanding as I watch the march of the athletes into the stadium. I learn a lot about the cultures of other countries, I learn the names of other countries, and enjoy their fashion choices. But I don’t want to go to Russia. Maybe it’s because I grew up with stories about Refuseniks, Jews who were not allowed to leave Russia or to practice Judaism freely in Russia. But also, Putin scares me. And Siberia scares me. The extreme cap on free speech, and the ease with which they throw people into prison, scare me. But I still love watching the Olympics on TV, whether it’s on time or delayed or taped on my DVR. Somehow they get me to watch ski jumping, and snow boarding, and rhythmic gymnastics, and beach volley ball, for hours. I think I even watched a few minutes of curling last time around. · The great poopy run – judged like a rhythmic gymnastics routine. Cricket is in the lead! · The long distance pee trip – a dual test, both of how long can you walk, and how many times can you pee in one walk without refueling. 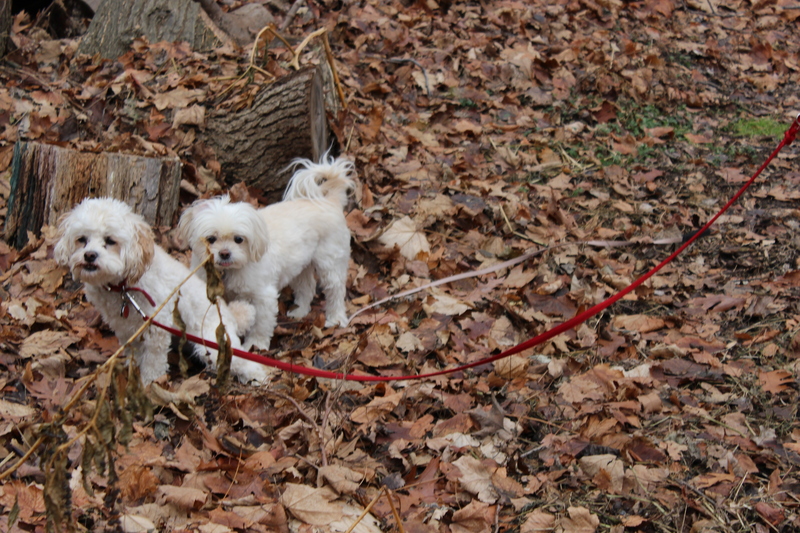 · Synchronized peeing, a pairs’ event – two dogs trying to match their stance and the length of the pee at the same time. Butterfly and Cricket have been practicing for this event for months. Consecutive peeing, it’s a start. · The escape from your harness event – how fast, and with what level of ingenuity can you get out of your harness? Cricket is the odds on favorite! · The barkathon – endurance, volume, artistry. And then, the group barkathon! Butterfly’s looking to Cricket for lessons. Wouldn’t a group barkathon be the ultimate way to end the closing ceremonies? Posted in dogs, memoir and tagged dogs, events, figure skating, humor, memoir, Olympics, pets. Bookmark the permalink. How adorable they are! Have to agree that the idea of a trip to Russia doesn’t appeal to me either! Love your post. I was just wondering. Is there a urine test, before the peeing contest? Interesting question. May have to check for diuretics. I wish l had the guts to go…. Love it! 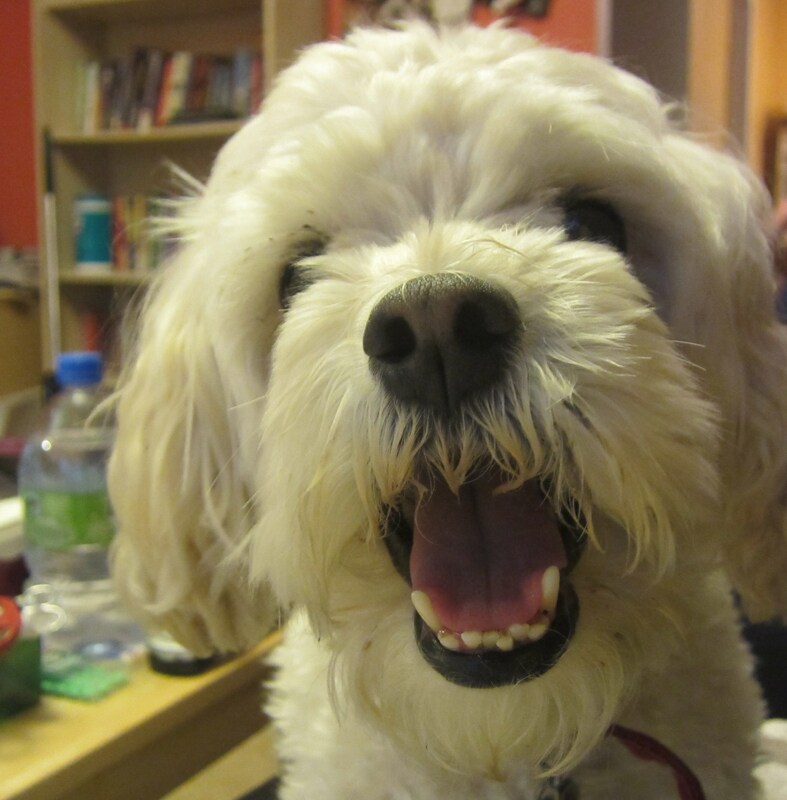 Yes to everything in this post — starting with Putin, but not overlooking the barkathon! Can you imagine if all of the Sochi dogs could be trained to do a barkathon at closing ceremonies, and then just give Putin a stare, as a group. I would love that! Love those silly girls. And I love the way you write about your dogs. A three dog team! That’s a very impressive accomplishment. Cricket and Butterfly are practicing their mirror peeing, so they can look at each other as they pee. They like to vary their choreography, just to see what works. The new one would be perfect for the Olympics. I thought Kenzie was good-he could mark me as I was peeing, but he had an advantage-he was male. Kali is almost as good and wins the woman’s peeing paws down. Who needs synchronized when you’re hitting a live moving target? Wow. Kind of a doggy biathalon event. Totally adorable. My Woozle is white, she can be in your team although she’s feline. She does the wall of death once a day too, so can compete. Yes! We need climbing events for cats, and jumping events, and there could be some vocal competitions as well. I need to find a way to attach blades to some doggy boots. That wouldn’t be dangerous at all, right? Thank you! I’ll have to think of a few more events, and maybe add in events for other animals. Maybe even mixed pairs for cat and dog couples. Great ideas. I think you should start a dog Olympics! Cricket is ready to start her training right now! Instead of medals, the winners get a whole roasted chicken, deboned of course. totally agree with your views on Russia. Russia is SCARY! Gosh, cricket and butterfly……..so gorgeous! 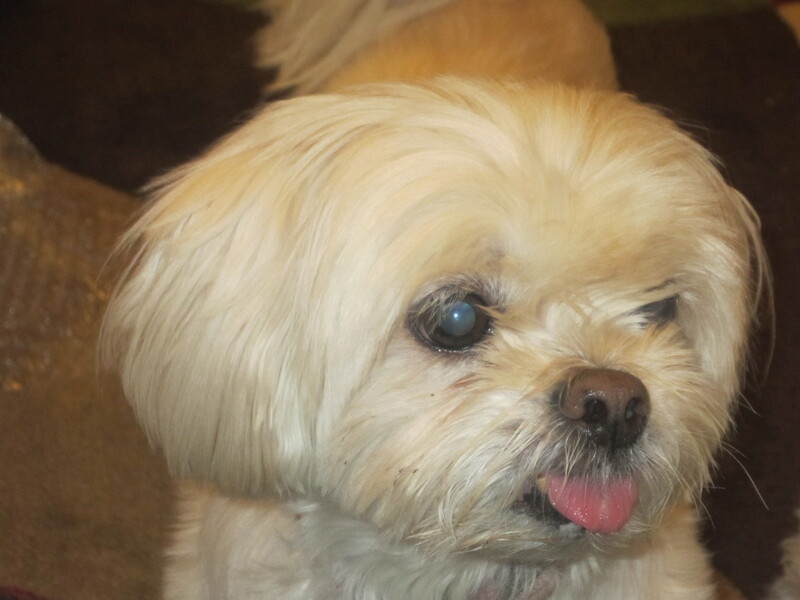 I had a Lhasa apso just like cricket, male. It passed away after 10 yrs.. Totally a one-man dog…….me! Would bite anybody else, including my sons, who were just babies! A Lhasa who bites people? 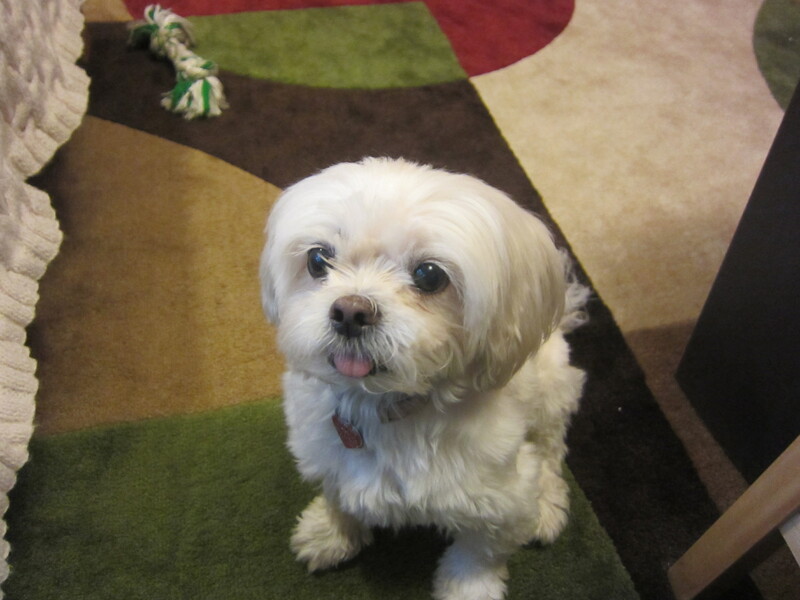 Butterfly had a bunch of her teeth removed after her life in the puppy mill, maybe that’s why I can’t imagine her biting anyone. Cricket, on the other hand, could give a lion a good fight. I like the events, but I don’t like Olympics politics nor the intense drive to win which has led to so many athletes cheating. It can be overwhelming to watch the kids who don’t live up to their own expectations. I keep wanting to reach in to the TV and give them a hug and tell them, it’s going to be okay. But I don’t think they would believe me. You have the cutest dogs. Considering everything, I would not want to be in Russia for the Olympics either. But Rio, for the next summer Olympics, that could be fun! I’m trying to decide how Bob Costas would introduce Synchronized Peeing to the American audience. I’d like to enter the “fetch” contest. See who can bring back the biggest stick. Oh my goodness! I think that event would be awesome. Cricket would be desperate to keep up with you, and land herself in the doggy hospital tent, wapping herself endlessly with those sticks. Putin scares me, actually I think Putin scares a lot of people. As for Siberia, I think of Scotland on a very bad winter’s Day – lasting about six months :o) I am also amazed at how many times during a walk they can pee without refuelling. We could have an event where the dogs chase a cat and points awarded on how they respond when the cat stops running and turns to face them. All controlled, of course, so no one gets hurt. Well, if we’re adding other animals in to complicate matters, i think there will have to be squirrels, and trees for the squirrels to climb. And then there could be birds overhead, as distraction techniques. oh my goodness! Such adorable photo’s and I LOVE this post so much, you’re doggy Olympics events are inspired and are definitely something my three could get their teeth into. But we agree with you on two points very strongly – 1) pups in tiny ski boots would be the most adorable thing ever and 2) Russia’s strict rules and Putin are very scary indeed. Enjoy the rest of the games! Did you see the picture of the Putin look-alike dog? I felt so bad for that dog. I hope no one ever told him about his human clone. It does mess with my mind, thinking, oh, such a cute little Putin-dog. Oh yeah! Doggie Olympics would be great! Single event peeing, synchronized pair peeing, etc. And there could be many other events as well…. Cricket and Butterfly would be adorable entrants. They are both training for the napping event now. I think they should put that one in the human Olympics. Your Olympics I would definitely watch! Thank you! We could get Animal planet to do the commentating. Pit Bull announcers! Any dog is a wonderful addition to your life. if you can’t have a dog of your own, make friends with someone who has a dog offer to puppy-sit. It’s better for you than taking vitamins! I really enjoyed all of this banter! 🙂 I have been happy to see the Olympic events that I love to watch, (even at 3 a.m. here!) Now I have images in my head of cute dogs participating in the games….at 3 a.m. I’ll probably be seeing said dogs superimposed on the athletes on the screen! Stranger things have happened…. Cricket wants one of those speed skating outfits! She is adorable with her tongue out. Little Miss Butterfly can’t help but be adorable. That would be so great, an escape Olympic. My crew would be great at it. Clearly, this is what they should have done with the dogs in Sochi. No extermination or shelters, give them hotel rooms and events to compete in and lots and lots of snacks! Definitely, doggy heaven on earth. They are such adorable little dogs. The judges will get incredibly dizzy! Doggy Olympics would be much more fun than regular Olympics! Too fun and cute! My mom’s Chihuahua Fawn used to stand on her front hind legs before peeing. Dogs are so amazing. 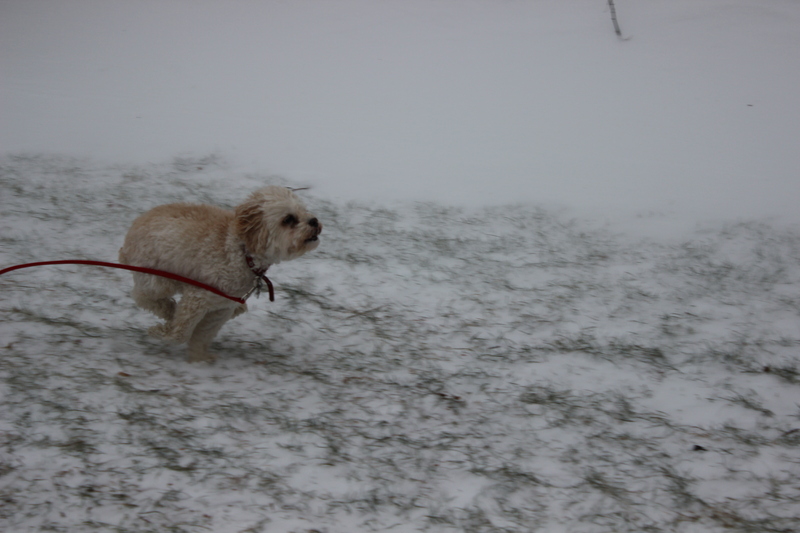 Cricket thinks snow is a magical thing; it turns her into a bunny rabbit! may I reblog this for a Thursday Guest Blog spot at betterendingsnow.com? Very cute! I would love that. Thank you! Aok. Would you like to send a brief bio with contact and web info? Just a link to my blog would be great! Bwah!!!! This post is hilarious!!!! That one of Cricket taking off like that…friskers to the max…Best title I’ve read in quite awhile…Have a wonderful rest of the week and tons of treats to Cricket and Butterfly!!!! Thank you! The puppies are now racing over to the bag of chicken treats in anticipation! 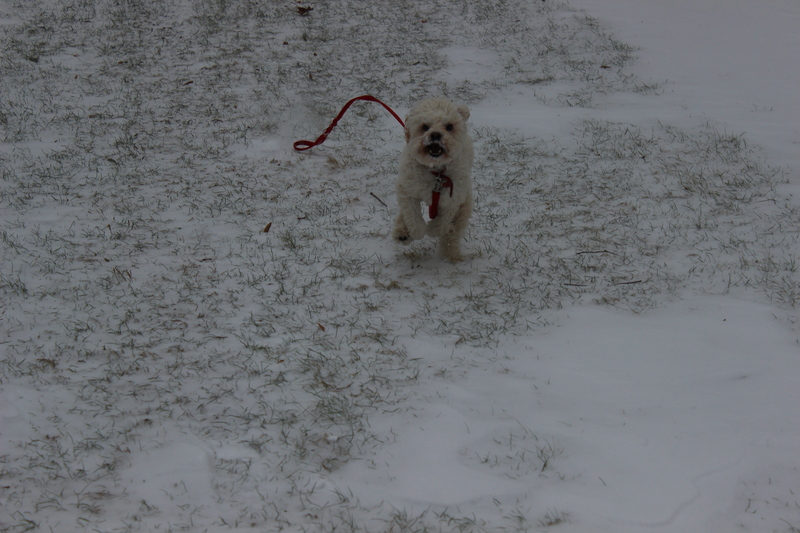 I can’t imagine Jack on ice skates; he is such a little Odie that it would be a disaster lol. Not even roller skates? One roller skate? LOL- Good one, Rachel. Actually we have a Pastor/Professor at our Seminary in Novosibirsk, Siberia for the Lutheran Church there. He wrote an interesting blog post on the freedom of speech being better than we think and better than here in many ways. I will try to FW this to you. I was amazed. As far a Putin goes , well he needs to let someone else run the show now. People have had enough of him. … On the Dog Olympics, there is now a new agility thing on with the Westminster Kennel Club and mutts are allowed to compete. I do think your post here was very funny and imaginative. Maybe you can do something locally with those ideas. With our corgis, we belong to a corgi group and have a picnic each summer. Those type games are played and all have fun. Nothing like about 50+ corgis all enjoying that. Butterfly would love to be an honorary corgi for the picnic! I laughed and so much more. Thanks to you and the Olym-pee-ads. Cricket wants in on this event, but she’ll have to put on some weight to really compete. Time for more chicken treats!